Louise Nevelson was born in Kiev, Russia, in 1899 and immigrated to Rockland, Maine, at the age of six. Following her marriage in 1920, Nevelson moved to New York City where she studied at the Art Students League from 1929 to 1930 under the tutelage of Kenneth Hayes Miller. She continued her education by studying with Hans Hoffman in Munich and working as an assistant to Diego Rivera prior to participating in her first group exhibition organized by the Secession Gallery at the Brooklyn Museum in 1935. As a part of the Works Progress Administration, Nevelson taught art at the Education Alliance School of Art in New York and received her first solo exhibition at the Nierendorf Gallery in New York City. In the late 1940s and early 1950s, Nevelson worked at the Sculpture Center in New York as well as at Atelier 17. It was during the mid-1950s that she produced her first series of black wood landscape sculptures. Shortly thereafter, three New York City museums acquired her work: the Whitney Museum of American Art purchased Black Majesty, The Brooklyn Museum purchased First Personage, and The Museum of Modern Art purchased Sky Cathedral. In 1967, the Whitney Museum of American Art in New York organized Nevelson's first retrospective. Since then, her work has been the subject of over 135 solo exhibitions including a posthumous 1994 retrospective organized by the Palazzo delle Esposizioni in Rome. 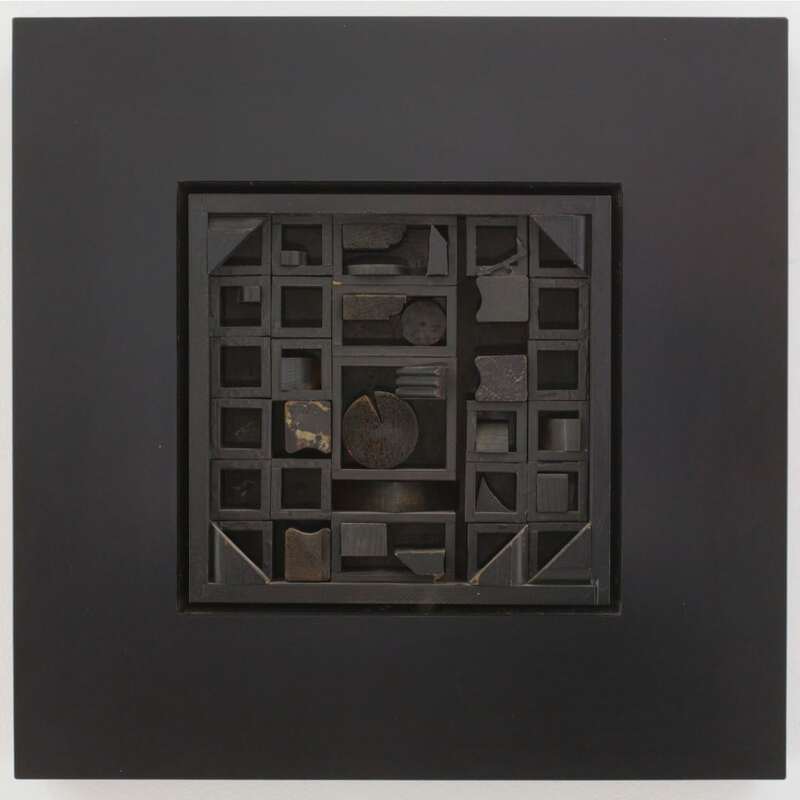 During the 1970s and early 1980s, Nevelson was occupied with numerous public commissions and the production of large-scale sculpture and monumental environments often using Cor-Ten steel. Invited to participate in an international selection of group shows, Nevelson's work appeared in the Pittsburgh International Exhibition at the Carnegie Institute in 1958, 1961, 1964 and 1970; the Venice Biennale in 1962 and1976; Expo 1970 in Osaka, Japan; Documenta III in Kassel in 1964; the 1973 Biennial at the Whitney Museum of American Art; and the Spoleto Festival of 1982-83; among others. 1963), and first vice president of the Federation of Modern Painters and Sculptors in 1962. She was also a member of the National Association of Women Artists and the Sculptor's Guild in 1962; a participant in the National Council on the Arts and Government, Washington, D.C., in 1965; and was elected to the American Academy of Arts and Letters, New York in 1979. Nevelson received honorary degrees from Western College for Women in Oxford, Ohio, in 1966; Smith College in Northampton, Massachusetts, in 1973; Columbia University in New York in 1977; and Boston University in Massachusetts in 1978. Nevelson was also recognized with several awards including Grand Prize for work in the Art USA exhibition at the New York Coliseum in 1959, the Logan Award for work shown in the 63rd American Exhibition from The Art Institute of Chicago in 1960, the MacDowell Colony Medal in 1969, the Brandeis University Creative Arts Award in Sculpture in 1971, the Skowhegan Medal for Sculpture in 1971, and the President's Medal of the Municipal Art Society of New York in 1979. Nevelson's work can be found internationally in over 80 public museum, university, corporate, and municipal collections including: The Art Institute of Chicago, Illinois; The Art Museum, Princeton University, Princeton, New Jersey; The Brooklyn Museum, New York; The Corcoran Gallery of Art, Washington, D.C.; the William A. Farnsworth Library and Art Museum, Rockland, Maine; the Galleria Civica d'Arte Moderna e Contemporanea di Torino, Turin, Italy; the Hara Museum of Contemporary Art, Tokyo, Japan; the Hirshhorn Museum and Sculpture Garden, Washington, D.C.; the Israel Museum, Jerusalem, Israel; the Julliard School of Music at Lincoln Center, New York; the Los Angeles County Museum of Art, California; the Louisiana Museum of Modern Art, Humlebæk, Denmark; The Metropolitan Museum of Art, New York; The Montreal Museum of Fine Arts, Canada; the Musée national d'art moderne, Centre Georges Pompidou, Paris, France; The Museum of Modern Art, New York; the City of New York; the Rijksmuseum Kröller-Müller, Otterlo, Netherlands; the Scottish National Gallery of Modern Art, Edinburgh, Scotland; the City of Scottsdale, Arizona; the Solomon R. Guggenheim Museum, New York; the Storm King Art Center and Sculpture Park, Mountainville. New York; the Tate Gallery, London, England; the Walker Art Center, Minneapolis, Minnesota; and the Whitney Museum of American Art, New York.